New Resource Scheduling & Project Task Integration! We’re pleased to announce an upgraded link between our Resource Scheduling and Project Management modules. Avaza’s Resource Scheduling module allows booking team members to Projects and Project Tasks based on their availability. This allows you to take into account their working hours, holidays and workload when managing assignments. Our new upgrade improves the integration between Project Tasks Management and Resource Scheduling, with the ability to keep changes to task assignments and resource bookings in sync. Now you can easily schedule your project resources with our new task/resource scheduling link and create schedule assignments directly from tasks. This new enhancement allows you to create schedule assignments from tasks and keeps them in sync when either are updated. For example, task assignments, and start & due dates can be kept in sync with the resource schedule booking for that task. You can create and update tasks and linked schedule assignments from all task-views in Avaza, including list-view, Kanban and Gantt Charts. We’ve also retained the flexibility for teams that want to use Task Management and Resource Scheduling independently of each other, or want to link multiple schedule assignments to a single task. Teams that do not need Resource Scheduling can switch the entire module off from the Scheduling Settings page. Learn about these exciting new features below, and if you’re new to Avaza Resource Scheduling, you can read our previous posts on this feature | Part 1 | Part 2 | Part 3. 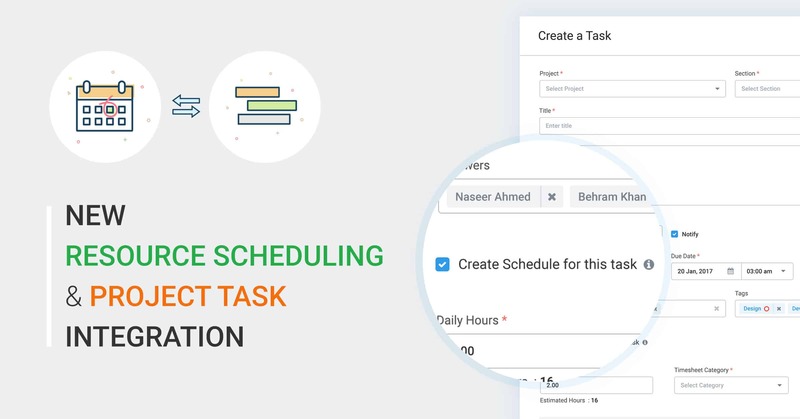 You can now create corresponding schedule assignments while creating a task in Avaza. Users with permission to create tasks will be able to create schedule assignments for teammates with the scheduling user role. 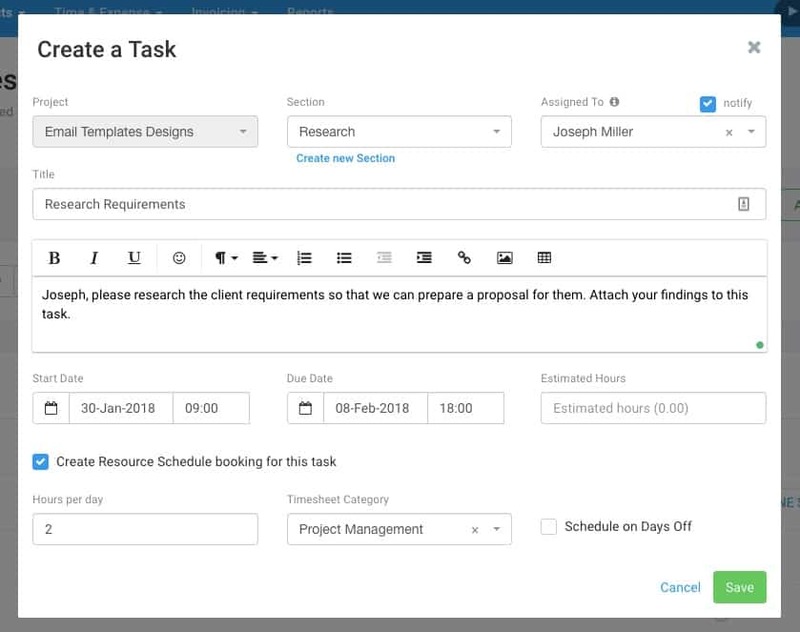 When you assign a new task to a project member, you will see a checkbox at the bottom of the popup called “Create Resource Schedule booking for this task”. Clicking on this will open the fields required to create the schedule booking, including Hours per Day, Timesheet Category and the option to Schedule Users on Days Off. You’ll also notice that the Team Schedule page now displays linked tasks on Schedule Assignments. Where only one schedule assignment is linked to a task any changes made to the common fields will be applied to both the schedule assignment and the task. This can be done in any of the task views: List-View, Kanban Boards, Gantt Charts. Resizing or moving tasks on Gantt Chart, including dependent tasks if auto-scheduling is switched on. Resizing assignments on Team Schedule page. Re-assigning a task to a user without scheduling user role will delete the linked assignment. Unassigning the task will delete the linked schedule assignment. These changes can be made by anyone with access to update tasks or manage the Team Schedule page. The Task Edit popup will now have an additional tab that can be accessed by Schedule Managers and Admin users. This tab allows them to manage existing bookings linked to each task. They can also add additional bookings to tasks from this tab. Tasks and Schedule assignments will not be synced where multiple schedule assignments are linked to a task. Should your team not want to use Resource Scheduling you can now remove the entire module and related reports from your view. To do so, navigate to Settings > Scheduling Settings and use the toggle button to hide resource scheduling module. Don’t forget to hit save once you apply the change! There are lots more improvements planned for Resource Scheduling. Do let us know your thoughts on this enhancement and what you’d like to see next!